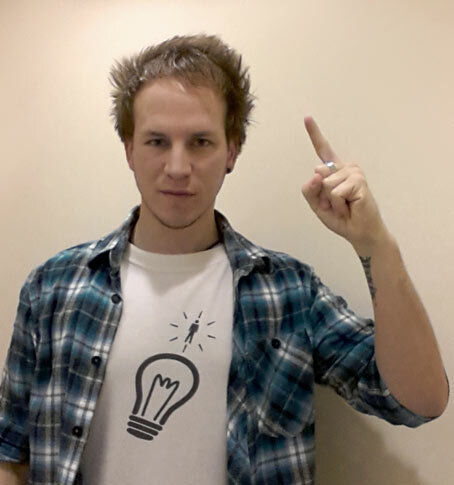 Today - January 1st 2013 - marks the first day of my long-awaited THREEHUNDREDANDSIXTEEFIVE T-shirt wearing challenge. This is the first photo of many depicting myself in a fresh T-shirt for the year and it was taken this morning after 2012 disintegrated beneath a cacophony of fireworks. The design on this T-shirt is one of my own entitled Idea and in a round about way it questions the very notion of having ideas. I mean, all the information that makes up an idea I have, I already possess. It's all already in my head. So what makes the perfect collection of thoughts suddenly leap to the foreground when I need to come up with something, especially when it happens spontaneously with seemingly no conscious thought at all? How can I take credit for an idea I've "had", when in all honesty, I cannot claim to know how I "had" it? I appreciate that thinking about thinking is a little heavy going for a New Year's Day hangover, so I'll wrap this up by suggesting that maybe an idea always exists out there in the ether; it takes the right person to translate it into action.